If you are nostalgic about the ’80s, this video will amplify that tenfold. The footage gives us a closer look at some of the legendary cars of the era, packed with burnouts, drifts and great engine sounds. Most notable appearances are the much-famed BMW E30 M3, rally legends in the likes of the Mitsubishi Lancer EVO 6 TME, Subaru Impreza 22B, and Lancia Delta Integrale. Naturally, there are some newer, also likable high-performance beasts seen in the video, but we know you’re eyes are gonna be focused on the old timers. The BMW E30 M3 was introduced when the Bavarian car maker decided to enter the 1987 DTM racing series. Consequently, BMW won two titles in 1987 and 1989 and proved their worth against the competitors in the likes of Mercedes-Benz and Audi. The BMW E30 M3 was never envisioned to be a high seller – BMW, after all, made it in order homologate the car for the DTM Championship where 5,000 units were required – but it quickly gained popularity with the car world, providing owners with one of the best road legal high-performance vehicles available at the time. First BMW M3’s of this generation was powered by an M1-derived engine. The inline-four engine displaced 2.3 liters and delivered 191 horsepower. In this version, the engine was paired up with a 5-speed manual gearbox. 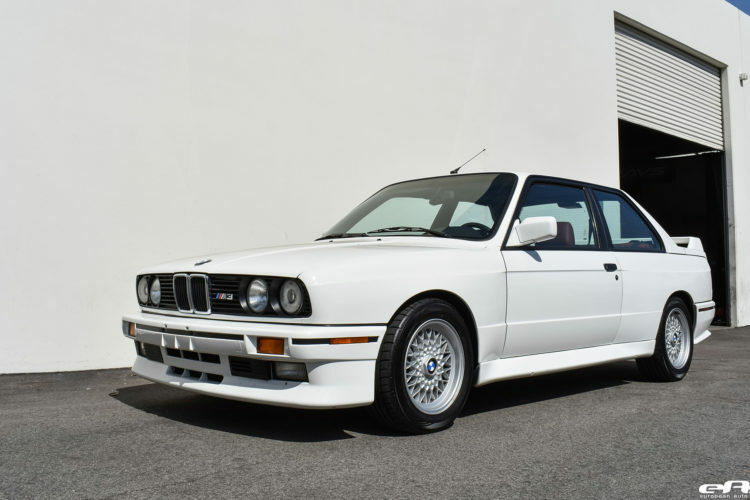 Later on, BMW revealed the BMW E30 M3 EVOII, powered by a 2.5-liter inline-four engine, delivering a bit more power – namely, 235 horsepower that provided a bigger punch for the owners. In its racing career, the M3 claimed numerous titles, among those the ones for the WTCC, the British Touring Car Championship, 24h of Spa and Nurburgring and the Italia Superturismo Championship. However, it never ventured (in a big way) in rally events, as these were ruled by the likes of the Lancia, Audi, and Subaru – all of which you can take a look at in the video below. Previous post VIDEO: What makes the E46 BMW M3 so great?